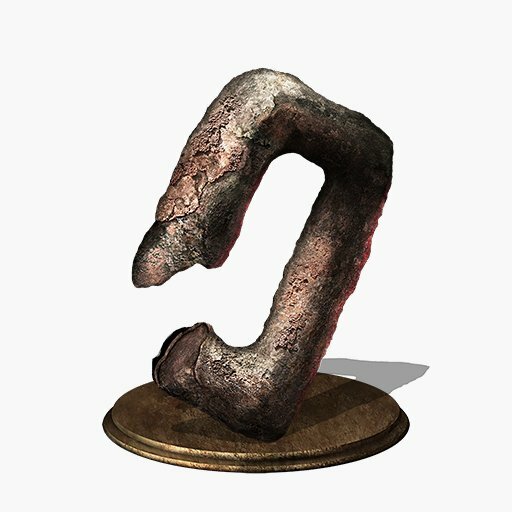 Portion of a steel chain used to restrain Gundyr. Gain vigor, endurance, and vitality, but take extra damage. Reduces Physical absorption by 4%. Reduces Magic absorption by 4%. Reduces Fire absorption by 4%. Reduces Lightning absorption by 4%. Reduces Dark absorption by 4%. Transposed from the Soul of Champion Gundyr. Prisoner's Chain New Game Transposed from the Soul of Champion Gundyr. Reduced Physical absorption by 10%. Reduced Magic absorption by 10%. Reduced Fire absorption by 10%. Reduced Lightning absorption by 10%. Reduced Dark absorption by 10%.